Exclusive Offer New Patients receive a free copy of Dr. Erlandson's book! Sign-up using the form or call us at (608) 783-5768 to take advantage of this exclusive offer. Welcome to Erlandson Family Chiropractic. Download your copy of Why Wellness Works by Dr. Ben Erlandson. Onalaska/La Crosse chiropractor Ben Erlandson, at Erlandson Family Chiropractic is one of the best chiropractors in the La Crosse/Onalaska area specializing in chiropractic care and wellness. Dr. Ben Erlandson is a chiropractor committed to providing natural healthcare so that you and your family can have a higher quality of life. 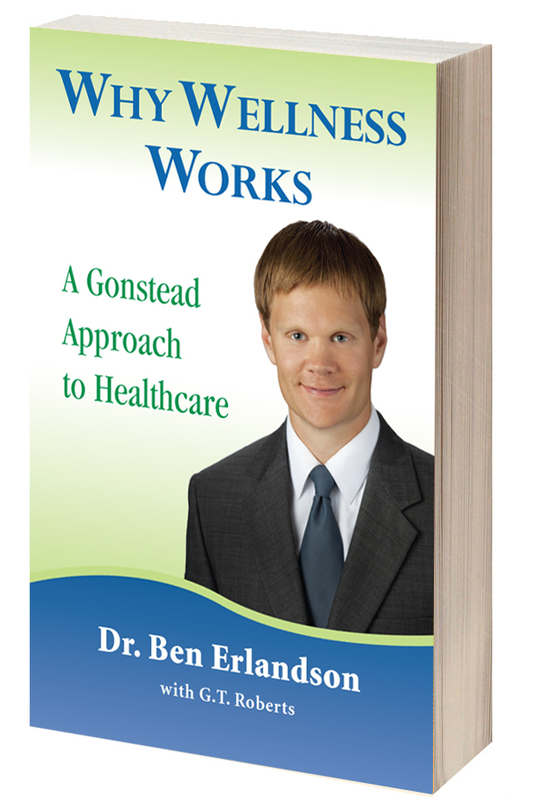 Dr. Ben Erlandson has written a book to guide you in your health and is available in print or e-book. Dr. Ben Erlandson specializes in the Gonstead System of chiropractic. The Gonstead System is unique because it is thorough, complete and specific in both analyzing and adjusting the spine. The Gonstead System is a gentle and safe technique for children and adults. Dr. Ben Erlandson, a Gonstead practitioner addresses your entire spine when evaluating for the presence of vertebral subluxations (spinal misalignments producing nerve interference or irritation) which cause ill health. Our goal is to help you and your family live your life to the fullest! At our Onalaska/La Crosse office you will receive the best care through the use of modern chiropractic techniques and technology. Dr. Ben Erlandson and the staff at Erlandson Family Chiropractic have a genuine concern for your well-being and health! Call us today and we can make an appointment to see if we can help you or your children. Dr. Ben Erlandson DC, SC, is a licensed Chiropractor serving the Onalaska/La Crosse area communities. Dr. Ben Erlandson specializes in the Gonstead System of chiropractic. The Gonstead System is unique because it is thorough, complete and specific in both analyzing and adjusting the spine. Dr. Ben Erlandson, a Gonstead practitioner addresses your entire spine when evaluating for the presence of vertebral subluxations (spinal misalignments producing nerve interference or irritation) which cause ill health.Dr. Ben Erlandson DC, SC, has been helping adults and children in Onalaska, WI since 2010. As a Chiropractor with experience, Dr. Erlandson DC, SC, is committed to promoting optimal health and well being of his patients. "I had terrible migraines since the age of 6 at least once a week and a lot of lower back pain. At first, I was afraid chiropractic would not help me. But after starting chiropractic care I have only had a few migraines. And my lower back pain is improving. I would absolutely recommend Gonstead chiropractic care. I never thought I would live my life without regular migraines and lots of medication." "I had really bad pain in my leg and a bad thyroid condition. I have used chiropractic for years and had great success with chiropractic for lots of different health problems. After a series of treatments with Dr. Ben, the pain in my leg is gone and I’m walking normally. I also had improvement in a thyroid condition that was causing me a lot of problems with energy. Gonstead chiropractic is very effective and I would recommend it to others."